Smart On is an ultimate Joomla template with clean, modern design, fully responsive and packed with awesome features. One template for all of your needs. Build with Bootstrap3 and packed with awesome features, custom modules and a lot of easy to use shortcodes. 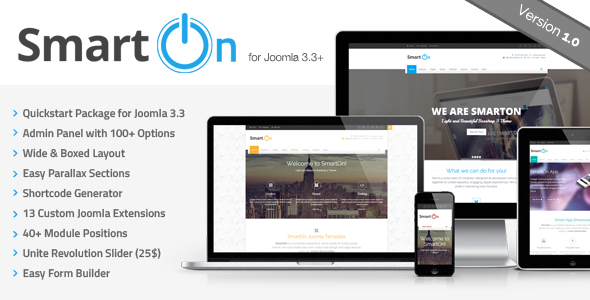 Item Reviewed: SmartOn New Multipurpose Ultimate Joomla Theme 9 out of 10 based on 10 ratings. 9 user reviews.